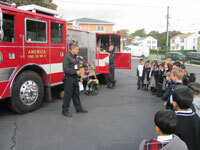 Last week, the students enjoyed a visit from Perth Amboy’s Bravest Firefighters. They share basic fire safety information with children and show them the fire engine and what a firefighter looks like in bunker (firefighting) gear. The presentation focuses on teaching children that firefighters are their friends, not to play with matches and lighters, and how to safely exit the home in case of fire. During National Fire Prevention Week, October 9 – 15, 2011 attention at the ACS was focused on promoting fire safety and prevention. All age groups were also taught about the dangers of playing with fire, what to do in case of a fire, and the importance of smoke detectors.